Checks for damages to the home are typically issued jointly in the name of the policyholder and the mortgage lender if the homeowner still has a mortgage. This is typically a condition of mortgage loans. 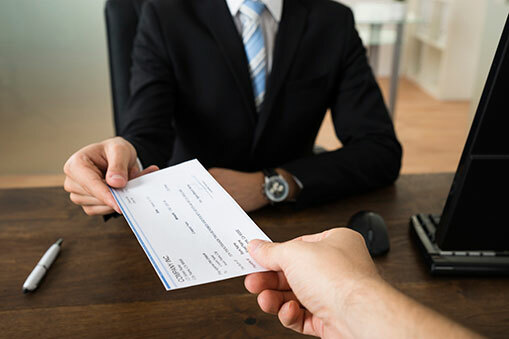 When the check is issued in both the homeowner’s and the mortgage lender’s names, the lender has equal rights to the funds and also has authority to ensure that necessary repairs are made. Lenders usually put the funds in an escrow account. Homeowners should show their lenders some contract bids after receiving them. It is best to wait for the lender’s approval. In some cases, the lender may want to conduct an inspection before authorizing a contractor to start making repairs. With some construction companies, customers are required to sign a form that allows the insurance company to pay the funds directly to the contractor. If this arrangement is made, the contractor will bill the insurer. Homeowners should review their inventory of personal belongings every year. Update the list when needed, and make any necessary adjustments to coverage amounts. As homeowners acquire more expensive or rare items, they should discuss riders or separate types of policies with an agent to ensure full coverage for all items. Always save receipts for major purchases, furniture, electronics and any other items of value. For those who have a replacement cost policy, the cost of buying new items will be reimbursed. Cash value policies reimburse policyholders for the value of the lost items minus depreciation. Initial reimbursement checks from the insurance company are always calculated on a cash value basis regardless of the existing policy type. If a check for personal items does not come but the home is mortgaged, contact the lender. The check may go to the lender in some cases. Many insurers also provide lists of sources for replacing destroyed items. Always ask an insurer how much time is allowed to replace the items. When major damages to the home or personal belongings are sustained, most people have to live somewhere else until their items can be replaced or until their home can be repaired. Insurance companies reimburse most living expenses incurred during this period. Hotel stays, food and similar expenses are some examples. Save all receipts of these expenses. If a home is destroyed, the policyholder usually has several different rebuilding options. One of the most common choices is rebuilding on the same site. The amount of money needed to do this depends on the policy’s dollar limit and provisions. This can be found on the declarations page of the policy. Policyholders may decide not to rebuild on the same site and rebuild in a different location. When this happens, the insured receives an amount determined by the insurance company. Always ask an agent about these options before making a final decision. To learn more about policy options and what is included in an individual home insurance policy, discuss concerns with an agent.